Enjoy a day of shopping at one of Southern Florida's largest and popular shopping destination without the hassle of driving and parking. This tour includes shuttle transportation to Dolphin Mall with either a South Beach & Downtown Loop circuit option. The official Dolphin Mall Shuttle takes passengers to restaurants, shopping, and attractions from local hotels throughout the day, seven days a week via a fixed route. Ride on a comfortable van to Miami's largest outlet shopping and entertainment destination. 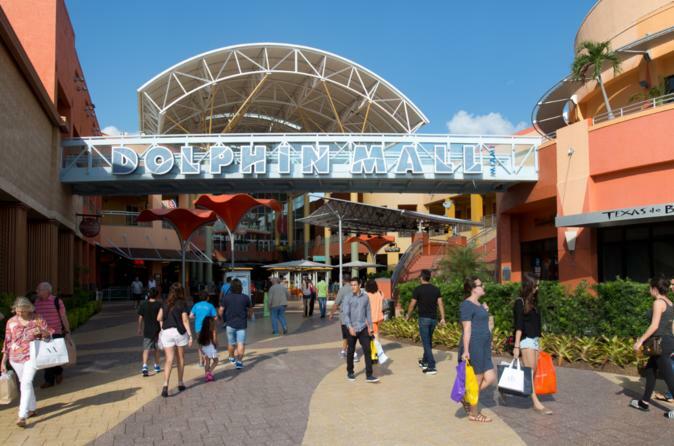 The Dolphin Mall is located conveniently five miles west of Miami International Airport at the intersection of the Dolphin Expressway (SR 836) and Florida Turnpike. Special Offer - Book and save 26% compared to the local supplier's adult prices! - Book Now!